BRIDGE 8 VT ROUTE 17 Archives - Count On It! 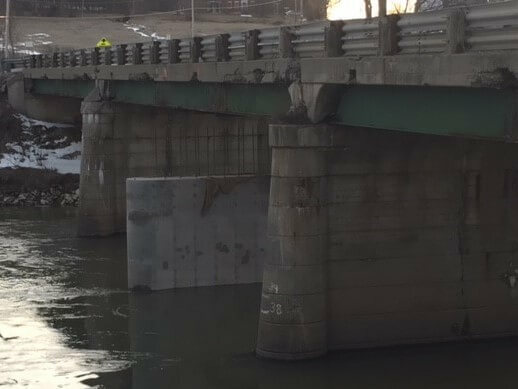 The Vermont Agency of Transportation (VTrans) in conjunction with CCS Constructors, Inc. will be replacing Bridge 8 on VT Route 17 over the Otter Creek in New Haven, Vermont. The new bridge that will be slightly longer and include two 11’ travel lanes with 4’ shoulders on each side. Also included in this bridge replacement project will be a new fishing access northwest of the bridge. This fishing access will include parking and a boat launch. Anyone with questions/concerns regarding the project may contact Stephanie Barrett, Public Outreach Coordinator at 802-862-6085 throughout the project. If you would like to receive a weekly update of the contractors anticipated work schedule please email sbarrett@coibsinc.com your request. This project is complete for the 2018 season. In 2019, the contractor will be back to complete the fishing access, at which time I will notify you. There will be no work scheduled on this project until further notice. Motorists should expect minimal delays! There should be minimal impact on traffic. THE BRIDGE IS NOW OPEN TO THRU TRAFFIC. Motorists should be aware of traffic control during the work week allowing for one-lane of alternating travel thru the construction area. Weather permitting, Bridge #8 will be opened to thru traffic tomorrow, July 27, 2018. The following is the anticipated work schedule for the week beginning Monday, July 30, 2018. Traffic control will be present during the daytime hours allowing for one-lane of alternating traffic over the bridge site. The bridge was opened to traffic on/before the anticipated schedule! The following is the anticipated work schedule for the week beginning Monday, July 22, 2018. Completion of the roadway approaches to the bridge. This project remains on schedule!